This month, Double Edge Theatre presents "Leonora and Alejandro: La Maga y el Maestro," a debut performance in the theatre's Latin American Cycle. Inspired by Alejandro Jodorowsky's novel, Where the Bird Sings Best, Leonora and Alejandro imagines a conversation between Jodorowsky and the late British-born Mexican artist and founding member of Mexico's Women's Liberation Movement, Leonora Carrington. Having worked together and inspired one another throughout their creative careers, the play is a meditation on the bridging thematics between Jodorowsky's and Carrington's work. As a special collaboration between Restless Books and Double Edge Theater, we're offering four free tickets to see the play, when you buy a first-edition hardcover of Where the Bird Sings Best. Read on for more information about the play and for a conversation between Restless publisher Ilan Stavans and Double Edge founder and Artistic Director Stacy Klein. Although different in approach, the creative inventions of both artists seem to "grow out of nothing, out of daily life,” Klein observes. “In Carrington’s writing, that growth is personal, intimate, while in the case of Jodorowsky, it’s always large-scale, epic.” While the performance plays on the nuance of belief and vision of the two artists, conversation covers common concerns such as the oppression of female voice, the role of military puppets and corporate thugs, and the resolute destruction of land, water, and people. 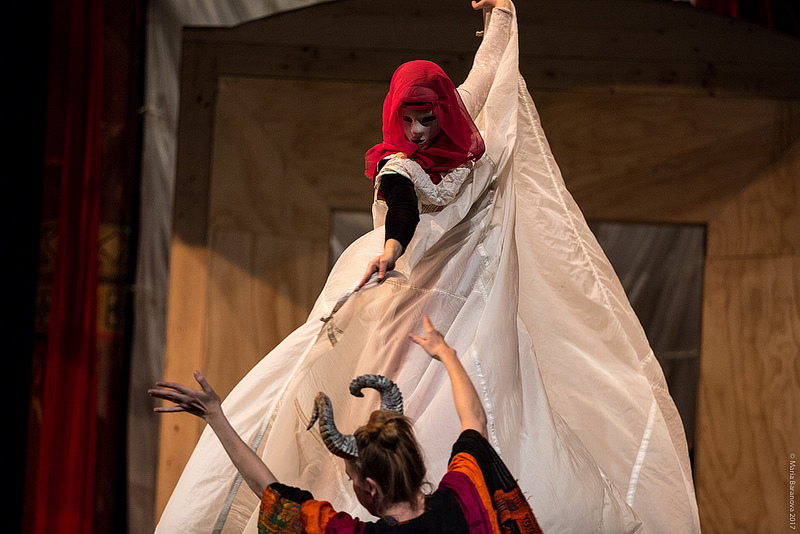 Jodorowsky has been the inspiration for the past two productions at Double Edge Theatre's Latin American Cycle: Cada Luna Azul and A Latin American Spectacle. Beginning the third cycle, however, Klein expressed a need to shift creative vision to incorporate a female experience, leading her to Carrington: an exquisite female counterbalance and a complement to Jodorowsky's artistic concerns. Stacy Klein: It’s a tricky subject, isn’t? I doubt if she had not written about her time in the asylum, or if the Surrealists hadn’t been so enamored by her gruesome time in that institution, that anyone would read mental illness into her paintings. They depict an imagination that many aspire to and few attain, and certainly a profound and female humanity. Although, as many of us, Leonora suffered, she was a fully functional person who painted and wrote among other talents for almost ninety years. Her one time in a ‘madhouse’ was at the outbreak of the Spanish Civil War and the Second World War, when she was first discovering her artist self and her partner at the time was removed from France and thrown into a concentration camp. Quite a vulnerable period. IS: In La Maga y el Maestro, you insert elements of Kabbalah that in my mind are appropriate. Of course, Carrington wasn’t Jewish. But Jodorowsky is: Jewish symbols overpopulate his oeuvre. SK: Yes, Jodorowsky is Jewish and used Kabbalistic symbols—and mudras and many other “spiritualities”—as part of his spiritual and artistic search. Carrington searched through her ancient Celtic roots and the Goddesses, and also delved into other traditions of interest, Tibetan and Judaism in particular, and the Mayan and Aztec cultures that surrounded her. Her paintings include the bath of Rabbi Loew, which is a reference to the golem, and a Kabbalistic map of the nine points of ascent, imbedded in a wise face. Her husband was a Jewish Holocaust survivor, and although he did not practice, her children, like you, were raised as Jews in Mexico City. IS: For Jews, the milieu was extraordinarily fertile. My father, also an actor, knew Jodorowsky well. He came to my house. For years one of his plays, El juego que todos jugamos [The Game We All Play], was in theaters. I never saw it but heard much about it. It was about archetypes: a politician in search of glory, a Communist in need of redemption, a businessman looking for fortune, a professor mindful of the authorities, a patient who is awaiting death, and so on. A new version is back. In 1985, I moved to New York. I looked at Mexico from afar and began to understand my upbringing differently. I found literature. Years later, by happenstance I became a publisher. One day I thought of Jodorowsky. I wrote to him via his agent. To date, Restless Books has released three literary books by him, including Where the Bird Sings Best. In my eyes he is simultaneously an offspring of magical realism, the aesthetic movement that gave us One Hundred Years of Solitude and other masterpieces, and a refutation of it. Logic is constantly being defied. And a bridge between the internal and external realms is built not for us to understand reality through our intellectual but to reconfigure it by other means. SK: Where the Bird Sings Best is my absolute favorite Jodorowsky book. It is magical, it is anti-intellectual, and it builds a reality that is unique and at the same time an imagining of one’s ancestry through the hardships, political crises, and personal problems that are universal. I tried to go back through my own ancestors thinking about grandparents love in a honey bath, or my mother’s burning up the sky with a dance. Of course it is extreme and often devoid of realism but in an age when the real is completely insane, the imagination becomes more grounding. IS: Jodorowsky’s films are impossibility egotistical, a word that is and isn’t synonymous with narcissism. The first has the ego at center stage, the second is about Narcissus looking at his own image being reflected. In either case, the effect might is disquieting. SK: My favorite Jodorowsky movie is Jodorowsky’s Dune. While this is about him, as usual, it is about a heroic attempt at an artistic creation, and for me it was about the struggle of an artist to achieve, how far to go, the vulnerability, and the balance of art and the need to survive, economically or just in terms of getting your work out there. I cried. I was touched. The rest of his films are good for some images, but really I am too old to spend time on a man’s ego. And he is such a great writer! IS: Theater—particularly experimental theater—might be the best medium to investigate the collision of Carrington and Jodorowsky. It brings it to life and gives it an enviable sense of intimacy. SK: This is one of the most fulfilling projects of my 40 years of directing. The dialogue, the worlds, the immersion of both of these greats in their work. I feel truly blessed. To me and to the ensemble, it is as if we are walking hand in hand with both of these astonishing artists. IS: Submerging myself in the work of these two masters, I am left with their politics. Carrington was a feminist unlike any other: restless, defiant, introspective; Jodorowsky, in turn, is a conquistador—a shaman whose tribe is linked through twitter. SK: I will take the feminist. Not only did she start before it was allowed or fashionable but she is completely necessary to lead these times. And her politics go way farther. She talked of animals and the environment before I knew what the word green was. I also think Jodorowsky’s description of the coal strike in Chile in Where the Bird Sings Best was so deep and profoundly important. As for twitter, I feel we would all be better without it, particularly in the case of some more prominent users. IS: Twitter is for Jodorowsky what an oil canvas is for Carrington. 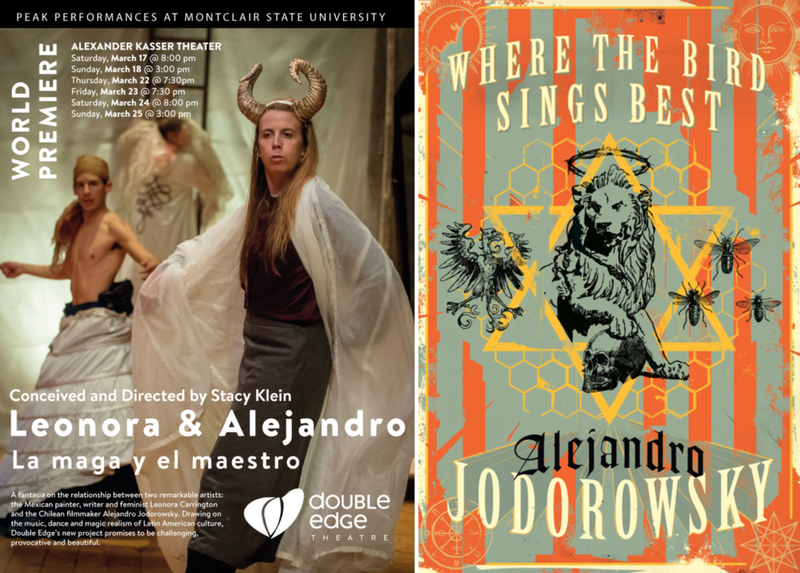 Leonora and Alejandro: La Maga y el Maestro will run March 17-18, and March 22-25 at Double Edge Theatre, Montclair State University. Get your tickets now, available for purchase on Peak Performance.